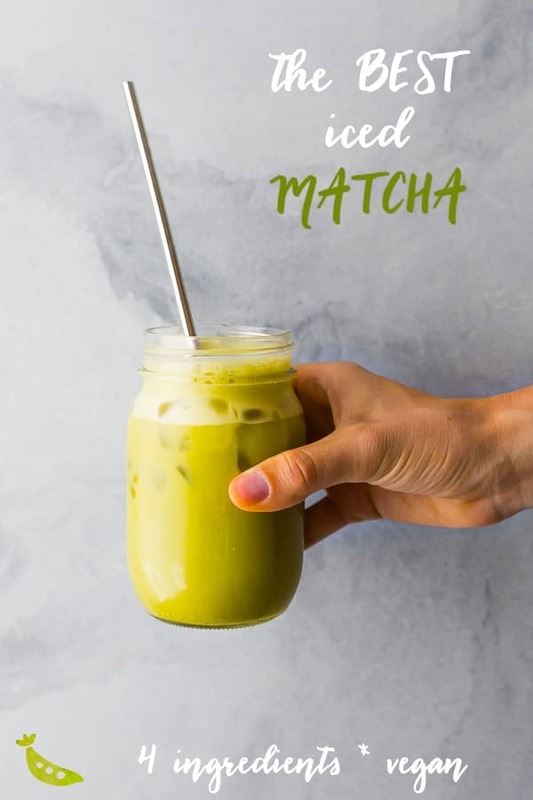 This iced matcha latte recipe is a simple, four ingredient recipe that is perfect for a summer afternoon pick-me-up! Vegan and refined sugar-free. 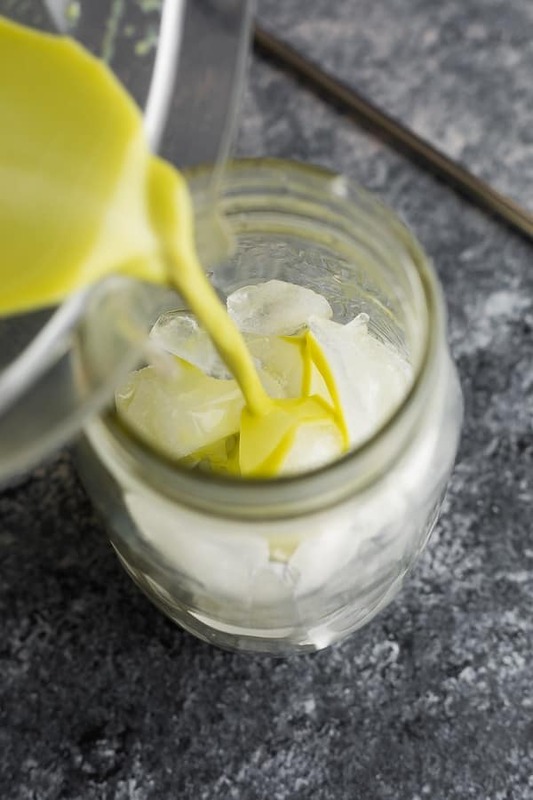 Looking for a healthy alternative to iced coffee that will still give you an afternoon pick-me-up? 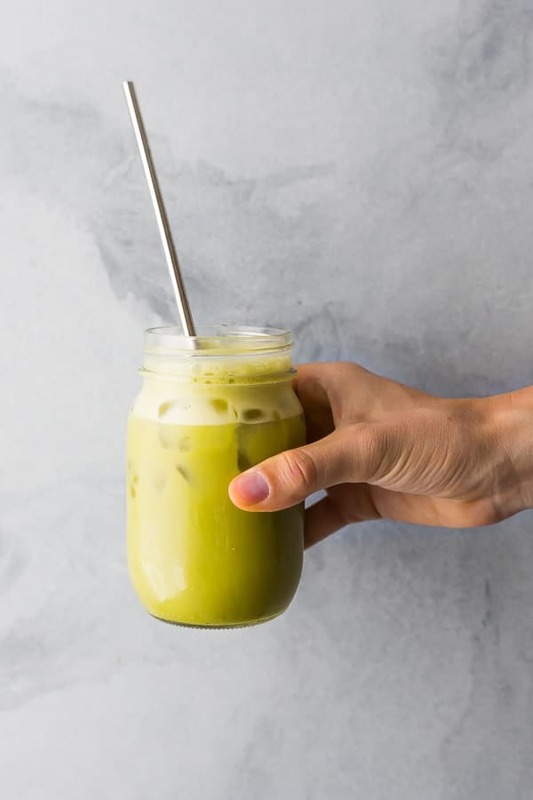 Then look no further, because this iced matcha latte is perfect! 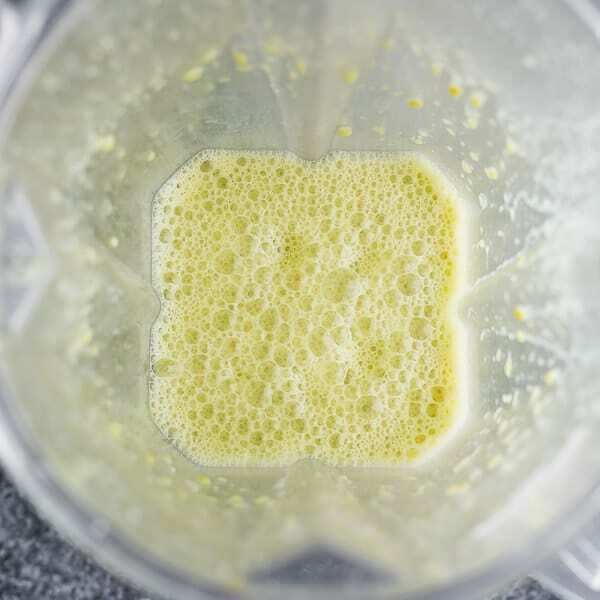 Not only is it super quick to whip up (only 4 ingredients) but it’s refreshing and full of antioxidants. And my favorite part is that it is soooo much more affordable than what you will find at Starbucks. $5 iced matchas can really put a hole in your pocket. I’m estimating this homemade iced matcha latte will clock in around $1.50…so hands up for homemade!! 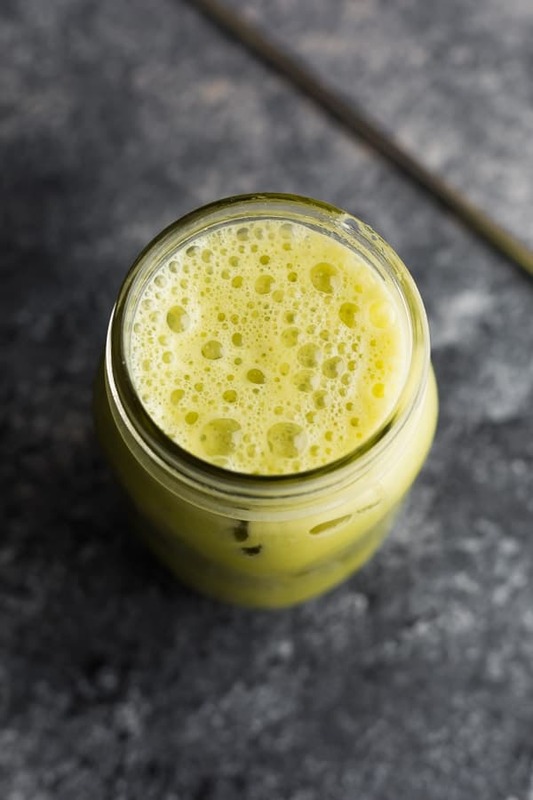 Unfortunately matcha powder doesn’t dissolve into liquid without some effort (many people will use a bamboo whisk), and I’ve found I enjoyed it more blended into iced almond milk lattes or this matcha avocado smoothie using my blender. Many people prefer the feeling they get from drinking matcha versus coffee, which is a more ‘zen’ and ‘focussed’ energy. Have you ever had a cup of coffee and ended up feeling scatter brained and unfocussed? I HAVE!! 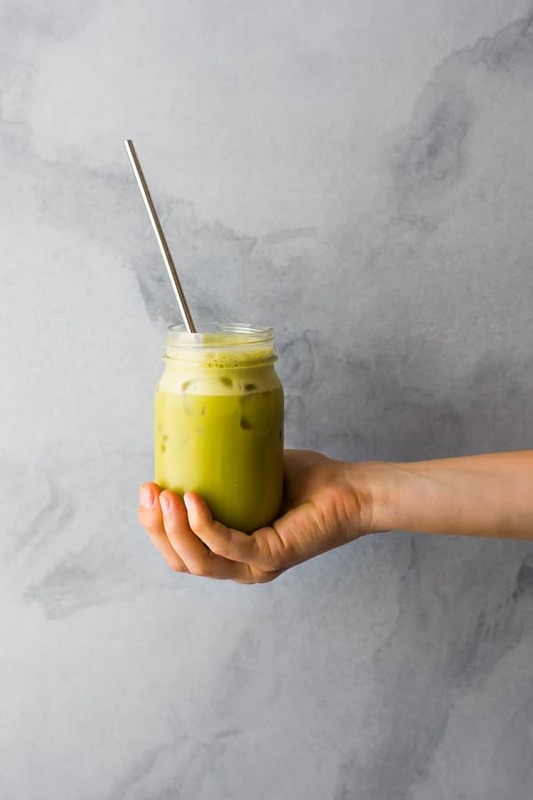 This is a very basic iced matcha latte recipe with matcha powder blended up with almond milk. I added a touch of vanilla extract and some maple syrup because this helps tame the ‘grassy’ flavor that green tea can sometimes have. You can certainly add more or less based on your taste preferences! So. How do you like your iced match latte? Leave a comment to let me know how you get your perfect drink! Place all ingredients in a blender. Blend for 20-30 seconds, until all match powder has dissolved. Pour into a glass filled with ice. Enjoy! Hi – this looks great. 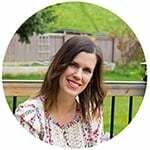 I am trying to keep my carbs low so I am wondering if you have an alternative to the maple syrup? It is my favorite Starbucks drink at home!!! This is perfect, thank you. And so much cheaper, right?! So happy you enjoyed, Marty! 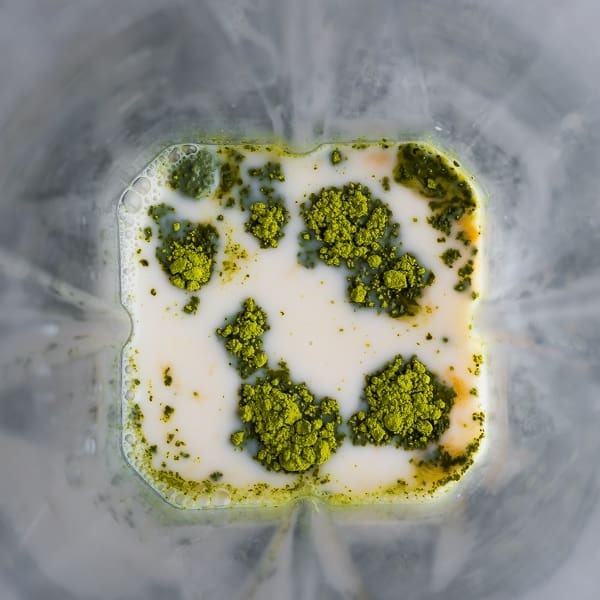 do you have a recommendation for matcha powder yet? I definitely want to try this!